The campaign against the minarets was fuelled by just these anxieties and allegations. Voters were drawn to the cause by a manipulative appeal to popular fears and emotions. 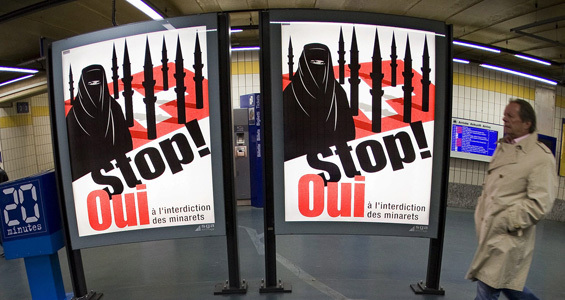 Posters featured a woman wearing a burka with the minarets drawn as weapons on a colonised Swiss flag. The claim was made that Islam is fundamentally incompatible with Swiss values. (The UDC has in the past demanded my citizenship be revoked because I was defending Islamic values too openly.) Its media strategy was simple but effective. Provoke controversy wherever it can be inflamed. [Please click here to read more]. Please click here to see a video of reactions after the vote. Muslim leaders from around the world, senior church figures, European politicians and human rights experts have deplored Switzerland’s decision to ban the building of minarets. The polarising verdict in a Swiss referendum held yesterday raised fundamental questions about discrimination and freedom of religion, with the Swiss government itself doubtful over whether the popular vote could be translated into national law, as required by the country’s system of direct democracy. The surprisingly high vote of 57% for the minaret ban put the Swiss government and establishment on the defensive, engaged in damage limitation. In Brussels, the Swiss justice minister, Eveline Widmer-Schlumpf, who opposed a ban, argued that the vote was neither against the Muslim community nor against Islam. She sought to explain the decision to EU interior ministers, some of whom were highly critical. The Vatican denounced the ban as an infringement of religious freedom. This ban is senseless. The Swiss have allowed themselves to be manipulated by people who want to influence policy by fear and hatred. Europe, despite its claims to the contrary, is no longer a plae of enlightenment, it is a continent of bigotry and prejudice.